Reproduction Painting "La maison dans les roses"
Are you dreaming of a stylish wall decoration? If your answer is "yes", then art reproduction "La maison dans les roses" is just made for you! Claude Monet created this amazing piece of art, which amuses with inspirational motifs as ground-breaking piece of art in this artist’s art work. "La maison dans les roses" art reproduction from bimago shop was produced by using print made in highest quality. Therefore, reproduction"La maison dans les roses" imitates its prototype. Art reproduction "La maison dans les roses" will be surely a unique decoration to your bedroom. We are sure, that art reproduction "La maison dans les roses" can be additionally a unique present for birthday or for other occasion. We recommend to add personal dedication, which will be placed in the back of art reproduction. Art reproduction "La maison dans les roses" in Reproductions categoryis one from over 4000 art masterpieces available on bimago shop – such a wide offer guaratees, that you will find on our shop canvas painting, that matches your taste for sure! Is a service that shortens the delivery time. Your order will be processed on a priority basis. Varnish protects handmande paintings - great presentation for many years! Canvas Print "La maison dans le feuillage"
Canvas Print "Enfant dans les roses trémières"
Canvas Print "La maison de l'artiste vue du jardin aux roses"
Premium Canvas Print is an original technique developed especially for bimago customers. 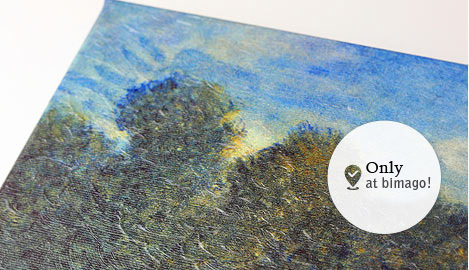 The highest resolution print is covered with colourless structural varnish that gives the canvas a unique texture and gloss characteristic for oil paintings. The additional advantage is that colour is enhanced and the pigment becomes more resistant to moisture and UV radiation. The varnish is applied manually by skilled painters who faithfully reproduce traces of the brush or spatula on the canvas. 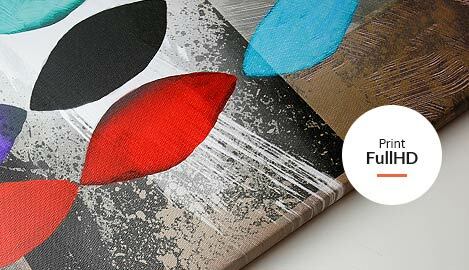 To make the painting's texture look as naturally as possible, we use high quality Spanish acrylic gel which is durable and absolutely safe. You can tell the difference! When you order a canvas print, what you get is not only the popular wall decoration. The product that you receive can be immediately hung on your wall: the edges of the stretcher bars are finished off and covered with canvas so you won't need any additional framing. The image is printed on the best Italian canvas. We use large format printers produced by a reputable Swiss company Zünd with print resolution of 360 dpi. As a result, the pattern can be reproduced with Swiss precision and its quality is comparable to the one achieved in the best digital laboratories. Such canvas print will be a lovely addition to your home. To make sure that the painting will look great on your wall – even without additional framing – we mount the canvas onto a matched stretcher bar made of natural, solid pine wood. Standard version is 2 cm thick. 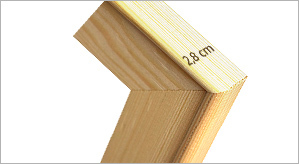 Thicker stretcher bars are perfect for larger paintings that are to be hung in spacious interiors. 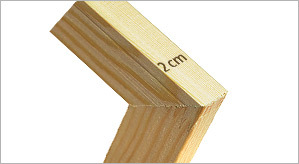 A 2,8 cm thick gallery stretcher bar guarantees that the canvas is properly stretched and creates a depth effect. If you want the painting to be an expressive decoration of the apartment you should choose a solid stretcher bars with 4 cm thickness. It's made of the highest quality pine wood which guarantees maximum exposure on your wall.